It is hard to believe that twenty-five years have passed since Gallery Pangolin made its entry onto the art scene with a modest stand at the 1991 Bath Art Fair. With a group show titled ‘Bronze Sculptures’ and its accompanying catalogue, the new gallery opened its doors in early 1992. Many memorable landmarks have followed and the gallery itself has been gradually updated from a former window showroom to the current light and airy contemporary space which makes the most of our outlook on the river. In the gallery world the challenge is to keep and excite the interest of both artists and clients by bringing fresh and engaging ideas to the table. 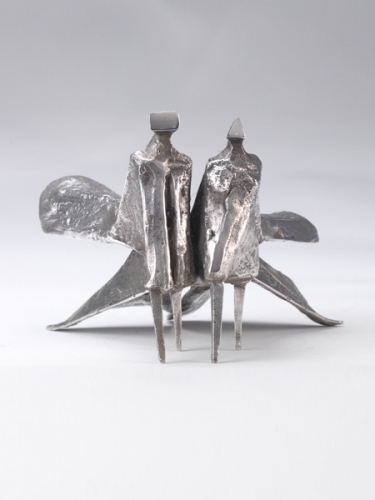 ‘Jubilee’ has certainly stimulated some stunning and outstanding silver sculptures by its thirty artists and we hope you will share our delight in their variety and undeniable beauty. Artists: Anthony Abrahams, David Bailey, Nick Bibby, Don Brown, Ralph Brown, Jon Buck, Daniel Chadwick, Lynn Chadwick, Ann Christopher, Michael Cooper, Terence Coventry, Steve Dilworth, Abigail Fallis, Sue Freeborough, Antony Gormley, Steven Gregory, Damien Hirst, Steve Hurst, Jonathan Kingdon, David Mach, Alastair Mackie, Anita Mandl, Charlotte Mayer, Eilis O'Connell, William Pye, Peter Randall-Page, Lorraine Robbins, Almuth Tebbenhoff, William Tucker, Deborah van der Beek.